UNI-KIT solar lighting systems are designed for use in remote homes, cabins, construction sites and other remote areas without access to the power grid. The UNI-KIT is a durable lighting system providing extended lighting hours. Simple plug-in connections make it easy to install. A basic power controller manages the system making it easy to use. This versatile system can also power a 12 volt radio or TV. 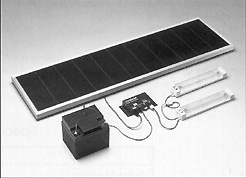 The pre-wired UNI-SOLAR solar electric module converts sunlight to electricity, charging batteries during the daytime for lighting use at night. It is lightweight and durable. There are no glass or fragile crystalline components to break or shatter. The unique structure of the UNI-SOLAR module enables it to keep on charging even on overcast days or when partially shaded. Each unit comes complete with 8m (25 ft.) wire from modules to Power Control Center, 3m (10ft.) wire for connecting lights, plus 5m (15 ft.) wire from Power Control Center to lights.